People tracking in crowded real-world scenes is challenging due to frequent and long-term occlusions. Recent tracking methods obtain the image evidence from object (people) detectors, but typically use off-the-shelf detectors and treat them as black box components. In this paper we argue that for best performance one should explicitly train people detectors on failure cases of the overall tracker instead. To that end, we first propose a novel joint people detector that combines a state-of-the-art single person detector with a detector for pairs of people, which explicitly exploits common patterns of person-person occlusions across multiple viewpoints that are a frequent failure case for tracking in crowded scenes. To explicitly address remaining failure modes of the tracker we explore two methods. First, we analyze typical failures of trackers and train a detector explicitly on these cases. And second, we train the detector with the people tracker in the loop, focusing on the most common tracker failures. We show that our joint multi-person detector significantly improves both detection accuracy as well as tracker performance, improving the state-of-the-art on standard benchmarks. The tracking result is available here. Tracking code  can be downloaded here here. 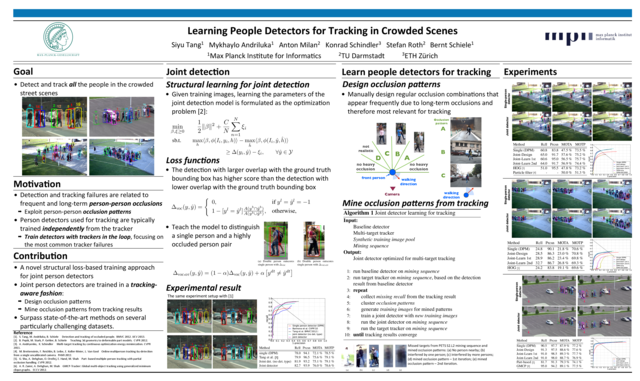 Learning People Detectors for Tracking in Crowded Scenes . S. Tang, M. Andriluka, A. Milan, K. Schindler, S. Roth, B. Schiele ICCV (2013). Multi-target Tracking by Continuous Energy Minimization. A. Andriyenko, K. Schindler, S. Roth CVPR (2011).